Save Now with Factory Direct Sale! We ship directly from the factory to you. Free Shipping (48 Contiguous States). Your tub is fully backed by Ella's warranty. 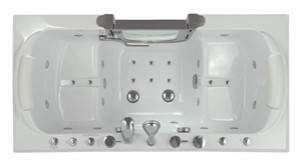 Shop tubs below by style or by name, click on a bathtub to find out more about sale prices. 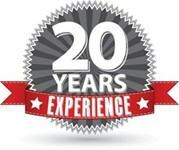 71" x 36" x 42"
52" x 28" x 38"
52" x 30" x 38"
52" x 32" x 38"
55" x 30" x 38"
60" x 30" x 38"
45" x 26" x 41"
51" x 26" x 38"
51" x 30" x 43"
52" x 27" x 43"
52" x 30" x 43"
52" x 32" x 43"
59" x 27" x 43"
Ella's Bubbles specializes in manufacturing the finest acrylic walk in bathtubs. Their Walk In Baths promote a greater sense of independence and pleasure through elegant design, innovation, and safety solutions. 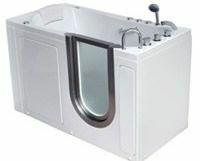 The acrylic walk in tubs are molded with thick acrylic. Then sprayed with a layer of fiberglass over for extra durability and insulation. This process creates one smooth seamless surface that results in a gloss shine. This surface is nonporous which makes it resistant to fading and it makes it easier to clean. The nonporous material also makes it more resistant to mold and mildew. The Gloss Acrylic option gives you a smooth, white gloss finish whereas the Textured Acrylic gives you a textured, off white finish. Both have the benefits that acrylic material offers, but each has their own aesthetic. Inward swing doors are great for the common bather who doesn't need the extra room to get into the walk in bathtub. They also are great space savers and perform well in smaller bathrooms as some bathrooms don't offer the space needed to accommodate an outward swinging door walk in bathtub. They also are self-sealing. As the water pressure pushes on the door it further seals it to prevent leaks. Outward swing doors benefit those who need a little extra room to enter the walk-in bathtub or those who have mobility issues and can't maneuver around an inward swinging walk in bathtub. 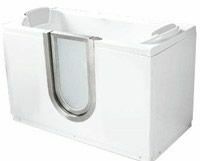 Outward swing walk in bathtubs are also the best option if you're looking for wheelchair access or a transfer walk in bathtubs considering that wheelchair accessible walk in bathtub seat height will align with the wheelchair. 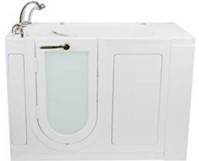 Ella Brand Outward Swing Door Walk In Bathtubs have 3 latches to prevent the door from warping. The 3 latch system increases the strength against water pressure to prevent any leakage. 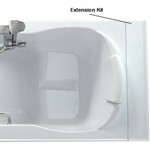 These bathtubs are designed with high quality chrome finish fixtures and ADA compliant controls. The custom door frame is made out of rugged yet elegant stainless steel, fitted with a waterproof seal, and backed by their lifetime limited warranty. 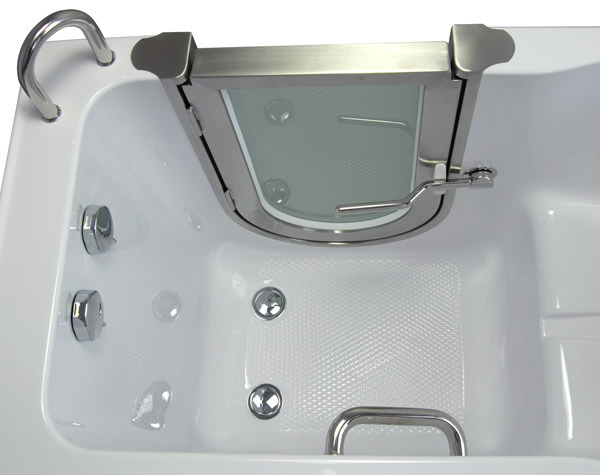 Ellas Bubbles Walk In Baths come equipped with a number of a safety features. A low threshold, aided by safety grab bar(s) and textured floor; ensure a safe and easy entry in and out of their walk in bathtubs. The dual drain technology equipped with two independently operated drain openers allows the tub to drain in as little as 80 seconds, guaranteeing a worry free exit. 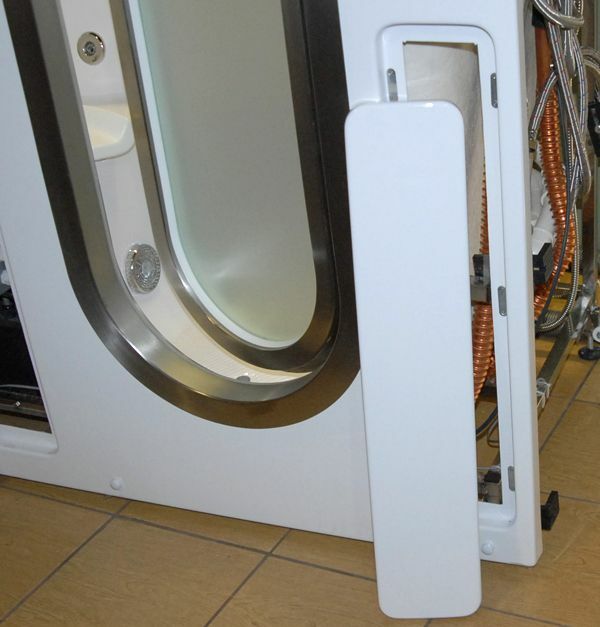 The toe kick access panel is designed for the threshold lowering option and convenient access to the bottom of the walk in bathtub. 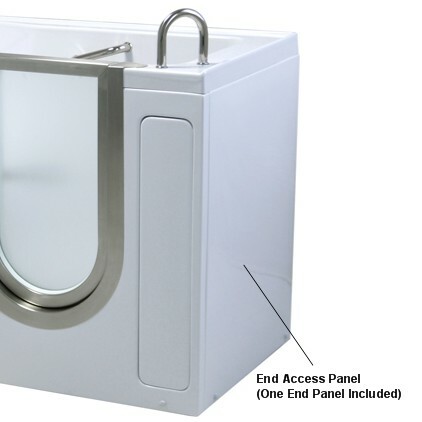 The end access panel covering faucet side is included for the two wall installation option, or the wall extension kit to fit our tubs into standard 60" openings as needed. 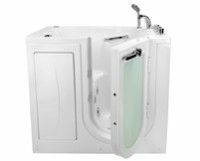 The additional end access panel for covering both ends of the tub can be purchased separate and installed by consulting your contractor. 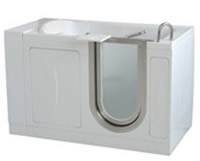 Ella's walk in tubs are rigorously tested to ensure they comply with North American plumbing and electrical safety standards and are ETL Listed and certified. The tub can be finished and tiled over as shown in image below (click on flange picture to enlarge). Caulking must be applied to joints as needed after the bathtub is installed. 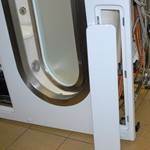 There are two removable front access panels, and one end removable access panel for easy access to all walk in tub parts in the event that service is needed. Taking a warm bath can do so much more than maintain a hygienic lifestyle. Running a warm bath can ease your tension and relieve many other minor medical ailments. This process is called hydrotherapy. Hydrotherapy is the process submerging your body in water to treat medical afflictions. It has been used for countless generations by many different cultures as alternative or home remedies. 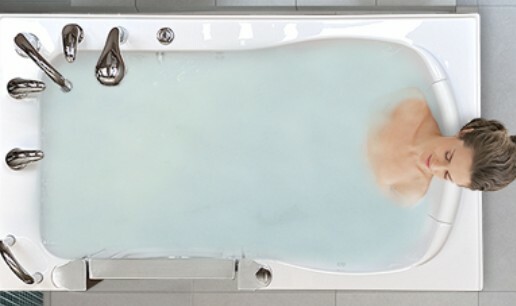 New and unique therapeutic massage feature to the bathtub industry. It is a calming experience that offers many added benefits to your bathing experience. It creates billions of small (10-50 microns) bubbles that float and reach the entire body surface. Strategically positioned air and hydro therapy jets can be run together or separately depending on the type of massage desired. The air jets are positioned on the floor for a lower body massage, while the hydro jets are located around the hip, seat and back areas. 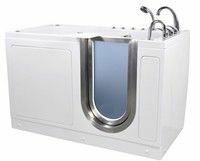 Combining the properties of air and hydro massage therapy, the Ella massage tub features hydro jets with an adjustable air flow control, an in-line water heater, and air massage jets. 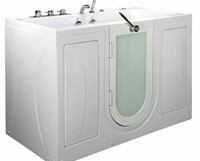 The hydro massage is turned on and off with an easy push of a button, and the hydro massage water flow intensity function is controlled by turning the rotary control handle. 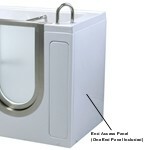 This feature allows you to adjust the water flow to either a mild, or more intense massage experience. This is accomplished by adding or reducing air into the water stream. - A Heat Lamp over the bath. - An Amba Towel Warmer will provide a warm towel to cover with.